Published October 1, 2013, Los Angeles Daily Journal – The release last week of Ron Howard’s “Rush” has served to highlight the intense love affair that the international sporting world has with Formula One racing. The film chronicles the 1976 racing season, highlighting the rivalry between racing legends James Hunt and Niki Lauda. But it is the exposure of the sport to the U.S. masses that is the film’s true hallmark of success. Formula One has long been considered the world’s most dominant sport, consistently playing to sold-out arenas twice the size of the Super Bowl. The series not only challenges the manufacturer-owned race teams to ruthlessly innovate, but its ability to complete a 20-race season is itself an engineering masterpiece. Each Formula One race is held in a different country — sprawling through Europe, North America, South America, Asia and the Middle East — necessitating the immediate and constant transfer of tons of precision equipment and scores of engineers across international borders. With each race team employing about 100 traveling personnel, all of whom are from differing countries of origin, the immigration issues alone are mind-blowing. As an example of the complexity, consider that on Oct. 6 the teams race in South Korea, and then have to be ready to race the following Sunday in Suzuka City, Japan. This is followed by races in India, Abu Dhabi and the U.S., before concluding the season on Nov. 24 in Sao Paulo, Brazil. Given this, it is no surprise that the top Formula One team (Ferrari) has an annual budget of $470 million and that it employs 525 people. By way of comparison, top Indy car teams (which travel throughout the U.S.) have annual budgets of about $15 million and employ an average of 20 people. The payoff is equally substantial. Each race is broadcast in some 200 countries, attracting an average of 336 million television viewers per event. To put this into perspective, the 2012 NFL regular season reached 200 million viewers for the entire season. 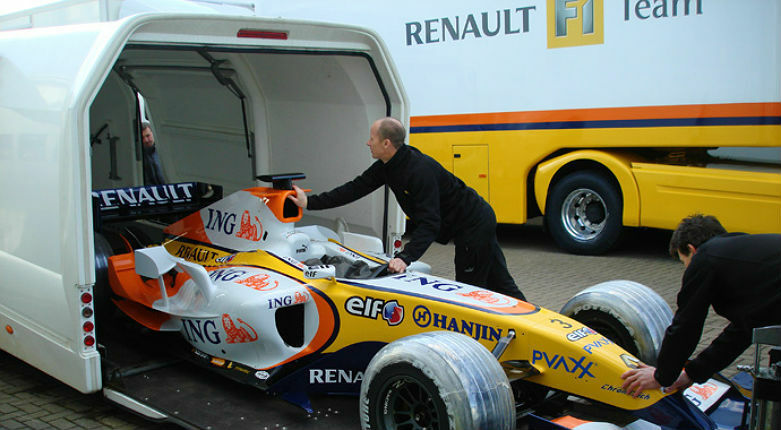 In fact, the marketing advantage of Formula One was so strong, that in 2005 energy drink giant Red Bull bought a Formula One race car and outfitted it with Red Bull logos. According to Formula One’s industry publication, Formula Money, Red Bull’s “advertising value equivalent” — the price it would have had to pay to buy a similar amount of on-screen exposure —– was $415 million in 2011. In part because the stakes are so incredibly high, and in part because of the nature of the sport, Formula One fosters an environment that thrives on risk. In a setting where winners and losers are defined by hundredths of a second, teams are encouraged — if not compelled — to bet it all on the hope of success. The result: teams push each other harder than everyone imagined. Pit-stop times hover around 2.4 seconds, and cars redline at 20,000 RPM, subjecting their drivers to lateral G-forces of 5.4G. If Formula One teams are the primary risk-takers, then the man who stands on top of it all —– Formula One boss Bernie Ecclestone — adds an exclamation point to the discussion. The fourth wealthiest person in the U.K. (recall that it was Ecclestone’s 22-year-old daughter, Petra Ecclestone, who bought Aaron Spelling’s Los Angeles mansion in 2011 for $85 million in cash), 82-year-old Ecclestone has been the Formula One kingpin for nearly 30 years. Ecclestone’s official role in Formula One is “commercial rights holder”; ownership of the series has long belonged to three banks that have permitted Ecclestone to serve as the face man for the series. Yet a mid-2000s attempt by a New York hedge fund to purchase the series set in motion a chain of events that is changing it all. In 2005, Bluewaters Communications offered to buy out the largest stakeholder in the series, German bank BayernLB, which held a 46.7 interest, for $1 billion in cash. The offer was the culmination of months of negotiations, but just to make certain that it would not be outbid, Bluewaters also offered to beat any competing offer by 10 percent. Bluewaters thought the deal was all but done. However, just six weeks after the offer was made, the German bank announced that it was selling its interest to CVC Capital Partners for $831 million. Two weeks later, the remaining banks (JP Morgan and Lehman Commercial) sold their interest to CVC for $419 million. The sale resulted in a windfall for CVC. Not only did it pay considerably less than what Bluewaters was willing to pay, but it picked up an asset that was worth considerably more than the $1.25 billion it paid. For instance, in 2007 CVC declared a $1 billion dividend from the series, and in 2012 a second $1 billion dividend was paid. The series has a current valuation of $9.1 billion. The other benefactor of the transaction: Ecclestone. As part of the transaction, the London-based CVC agreed to keep Ecclestone on as the front man of the sport — something that appeared doubtful under the Bluewaters deal. The decision to sell the series for hundreds of millions of dollars less than it would have otherwise received caught the attention of the German officials, who launched an investigation into the internal affairs of the bank. The investigation revealed that Gerhard Gribkowsky, the bank’s chief risk officer and the person in charge of selling the bank’s Formula One interest, had secretly received a $44 million payment from Ecclestone right before the series was sold. Gribkowsky admitted to the authorities that the payment was a bribe from Ecclestone to have the sale consummated with CVC, not Bluewaters, and he is now serving an 8½-year sentence in a German prison. The mischief has resulted in a melee of litigation between Bluewaters, CVC, the German bank, Gribkowsky and Ecclestone, for damages in the hundreds of millions of dollars. Actions are now pending in U.S. District Court in New York and the London High Court, but the real question was whether German officials would dare touch Ecclestone, with his quasi-royalty status in the sport. This summer, Munich prosecutors answered that question with a resounding “yes,” when they indicted Ecclestone on charges of bribery and incitement to breach of trust. If convicted, Ecclestone could face 10 years in a German prison. For the man who once said, “In Formula One, everyone cheats; the trick is not to get caught,” this indeed may prove to be one trick too many for the famed Ecclestone. At 82, his time was limited anyway, but it is a shame his exodus from the sport will forever be linked to scandal, disgrace and perhaps prison. As Shakespeare wrote of his figure Julius Ceasar, “The evil that men do is rememberd after their deaths, but the good is often buried with them.” For Ecclestone, his alleged attempt at maintaining control over the series he helped build may be eternally branded in the memories of all concerned.